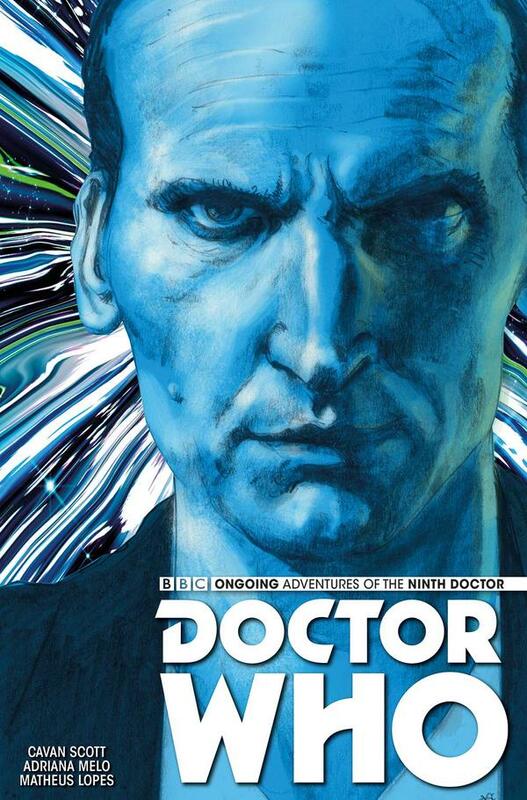 Doctor Who: THE NINTH DOCTOR #6 Review @comicstitan | Warped Factor - Words in the Key of Geek. ‘Somebody round here is an imbecile!’ cries Tony. What did you love most about The Three Doctors? I know, I know, but apart from the Gell Guards? If I know my Who-fans, it was the chance to see two or more Doctors on-screen together, interacting, wasn’t it? That thrill of the past coming back to lambast the present, interact with it, take the mickey out of its clothes and ultimately remind us all what things were like in their day. 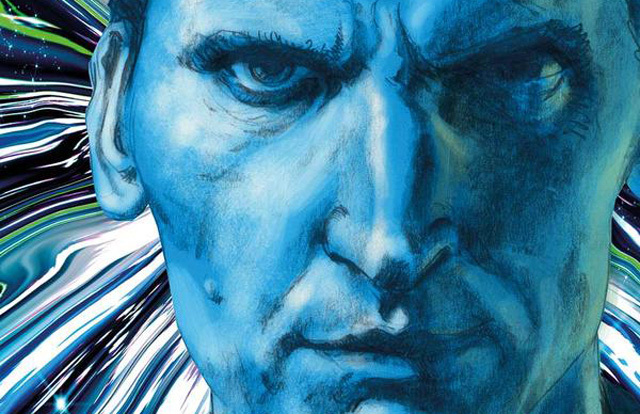 For issue #6 of the Ninth Doctor comic-book, Cavan Scott gives us a multi-Doctor story – although one of the Doctors here is definitely not the one you’re expecting. But what you get is almost the reverse of that Three Doctors sense, the Ninth Doctor going back in time to a place he knows well, and bossing people around that used to be his friends. It’s a fabulous idea, and the ‘other Doctor’ of the piece can certainly give as good as they get. But as in The Three Doctors, the two here quickly find a way to work together in the face of a credible threat, for all they may disapprove of each other’s methods. Monsters, monsters, everywhere seems to be the cry of the local defence force, with whom the Doctor is of course familiar. The whole set-up of this issue has an Invasion of the Dinosaurs feel to it – big scaly beggars appearing out of nowhere, very nearly making mincemeat out of the Gargoyle, and then disappearing again. We find out at least something in this issue about why they should be doing anything so fundamentally odd, but again in a Dinosaurs riff, there seems to be more going on than sudden squalls of monsters – there seems to be some underlying purpose behind the appearances, and this issue is very effective at making us wonder what the heck that might be, and wanting to buy the next issue just to find out. There’s a companion-abundance in the issue that may not serve the Ninth Doctor terribly well – Jack and Rose together are quite enough to give the sensation of a full Tardis, and they pick up another straggler early in the issue. Add that to the other Doctor in the plot and you begin to wonder whether the story is big enough to accommodate them all. Tara Mishra though quickly proves to be more than a straggler, and she has a fairly strong role to play in this issue. So does Rose, for all it amounts to mostly shouting at people – at least it’s characteristic shouting at people, with some solid heart at its core. If anything, it’s Jack who loses out on the character tombola, having only really the one signature moment, though when you see it, you’ll laugh more at its lack of luck than anything else. Never let it be said that Jack passed up the opportunity to flirt with a squaddie. If this flirtation leads anywhere, we may well eat this issue, but it’s fun to see him try his luck with this particular pair of square shoulders. Thematically, you could read this issue as a cris de coeur over the madness that has been 2016 and the relationship between the ‘locals’ who already live somewhere and the ‘incomers’ who need to share some of their resources. There’s a man at the heart of this story with a gift for conjuring the monsters, and he’s prodded to do so by a shouting, melodramatic orderly, who frightens him about the approach of aliens, or imminent danger to his family. Through electrodes strapped to his head, in this state of blind fear, he conjures up monsters on demand. You couldn’t really get a more cogent metaphor for either the strategies of the Leave campaign in Britain or the Trump campaign in the States. Someone scares you into thinking your family is in danger from aliens, and the monsters rise. There’s also a question of who best can serve the public interest in this issue – the forces of governments and international accords, or the forces of profit-driven entities (another highly topical issue both now and in the period of the action in this comic-book). When the chips are down and the monsters come, who do you trust more, people you can vote against, or people whose livelihoods you can affect verrrry slightly by your disapproval? But there’s more to issue #6 than that, however satisfying it is on that level. It’s a love letter to a previous era of the show and a previous way of scaring the socks off the junior audience for 25 minutes a week, along with a solid dose of early 21st century cheek and verve. Cavan Scott has taken a fork from the usual Ninth Doctor territory, and sends him into battle in an earlier time. The result is that odd combination – a Doctor out of his usual comfort zone, that manages to be both nostalgic and new at one and the same time. In a way, that’s quintessentially the essence of the Ninth Doctor of course – new and old at once, doing old things in new ways and making the journey his own. Adriano Melo on artwork and Marco Lesko on colours deliver some pleasing contrasts here, the first phase of the adventure being in what one character describes as ‘Hammer movie’ darkness, the rest channelling the studio sets and outdoor filming of an earlier era, functional spaces in which actors could convince us that the world was ending. All in all, issue #6 is off-kilter, but in a way that delivers a great synthesis between eras of the show – eras which, you realise as you read, had a great deal in common: new starts, new tone, new pace of storytelling. Scott, Melo and Lesko take you back in time, but with a modern punch and a distinctly Ninth Doctor growl, meaning you end up with the best of both worlds jockeying for position and control of their narrative. When they settle down and decide to work together, it’s the start of something magical.